[prMac.com] Spanish Fork, Utah - Faber Acoustical today released version 3 of its SignalSuite audio test signal software. Version 3.0 continues SignalSuite's tradition of offering tremendous flexibility in an audio test signal generator. The major upgrade gives SignalSuite new features similar to those found in the recently released SignalScope Pro, including advanced audio device configuration, project files, and Audio Unit plug-in support. Support for Audio Unit generator plug-ins opens up numerous new possibilities for SignalSuite. 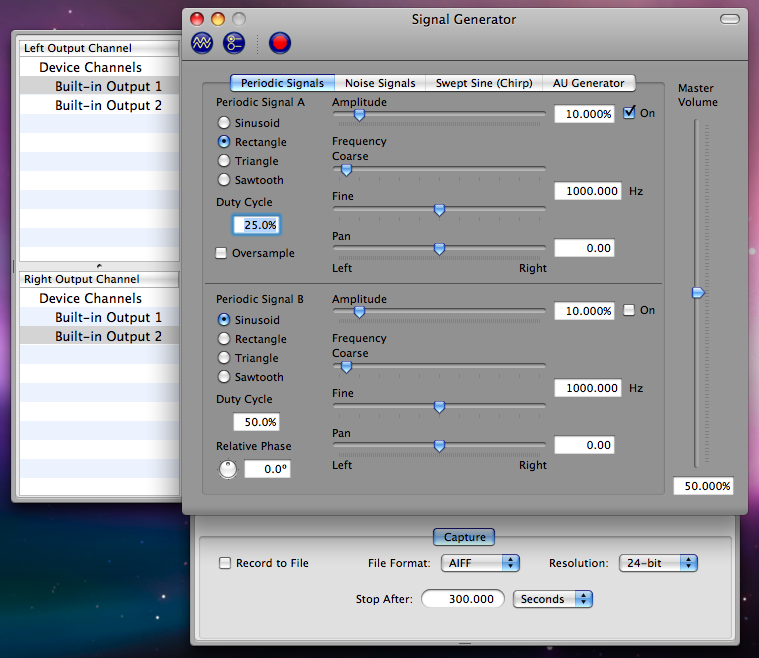 The AUAudioFilePlayer plug-in, included with Mac OS X, enables SignalSuite to play back signals stored in audio files. Portions of the audio file may be selected and looped for playback. Plug-in support also allows end users or third parties to develop additional signal types to expand SignalSuite's capabilities. SignalSuite's new project-based approach means users can save complex configurations in project files. This makes it easy to keep a number of different signal generator configurations on hand, any of which can be applied by opening its corresponding project file. SignalSuite 3 costs $39 USD. Licensed users of SignalSuite 2 can upgrade to SignalSuite 3 for $19 USD. Those with licenses for earlier versions of SignalSuite may upgrade to version 3 for $29 USD. Special education pricing is available. SignalSuite 3 requires Mac OS X, version 10.4 or later. More information on SignalSuite can be found at Faber Acoustical's website. Faber Acoustical Services and Technologies provides cost effective tools for acoustical instrumentation, analysis, and education. Faber Acoustical's expertise include acoustical measurements, active noise control (sometimes referred to as active noise cancellation or ANC), mixed-signal circuit design, digital signal processing (DSP), adaptive filtering, and embedded DSP and desktop software design.